Tuesday’s release of The War Machine doesn’t just feature a few multiplayer maps, it also includes the latest chapter of Nazi Zombies. The Shadowed Throne takes players to the heart of Nazi Germany, where Doctor Straub prepares for a final confrontation in his airborne zeppelin. The bad news? Reaching Straub means unlocking a complex Easter Egg that only a tiny percentage of players will ever complete. The good news? 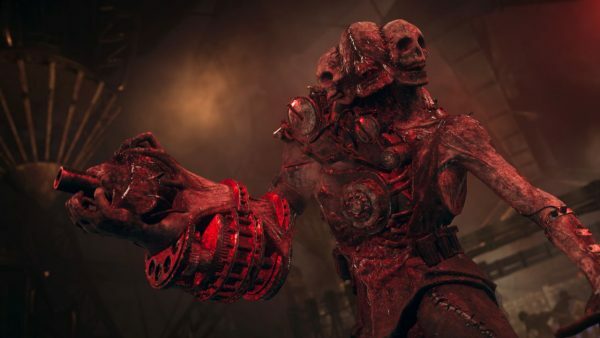 This guide will help you defeat Straub, gain Barbarossa’s Blade, and become one of the few players to complete a Call of Duty Zombies Easter egg. Before we even get to the Easter Egg steps, there are a few general strategies you should keep in mind while playing The Shadowed Throne. While you certainly don’t need them to succeed, they should make it easier to survive each round so you can focus on the immediate steps at hand. It is possible to complete the Easter Egg solo, but having at least one co-op partner makes it much easier. If you must play solo, use either a Camouflage loadout or a Shellshock loadout modified with Sustain Zone to give yourself some crucial breathing room as needed. Shadowed Throne introduces the Sizzler, a standard zombie transformed by the energy from Straub’s zeppelin. The Sizzler is incredibly fast, and can even outrun a player with the Laufenblitz perk equipped. If you want to avoid them, just keep a Pest or Bomber alive each round instead of a standard zombie. Yes, they’re more annoying than the average zombie, but they also can’t be turned into Sizzlers by zeppelin bolts. I highly recommend using the Pack Mule modification for its extra weapon slot. That way you can carry two standard guns and the Wonder Weapon without worrying about what you’ll have to give up. It also makes Step 6 much easier. Please note that since the Shadowed Throne Easter Egg relies on hidden objectives and random elements, so certain sections of this guide may be incomplete. We’ll make every effort to update this guide as more information becomes available. Step 1: Find the short-wave radio sitting in a corner in Main Street. When activated, you can rotate the left and right sticks of your controller to turn the respective frequency dials on the radio control panel. For Easter Egg purposes, you’ll need a Soviet radio frequency. Make a note of the code printed on top of the radio – it will be randomized each match. Go to the Church, and look at the Berlin map on the wall. You’ll see a single red pin in a specific region – make a note of its name. Beside the map are some posters. Cross reference the region name with the radio code you found earlier, and you’ll get a frequency to enter into the radio. Do so, and you’ve completed your first objective. Step 2: Now you need to find a flare. The flares are kept inside a box located within the Plaza. You’ll find it near one of the museum entrances, on a table against a wall. If you see a corpse and a glowing flare near the table, you’re in the right place. Melee the box once to break the lock, and then hit it again to launch a flare into the sky. Be warned! 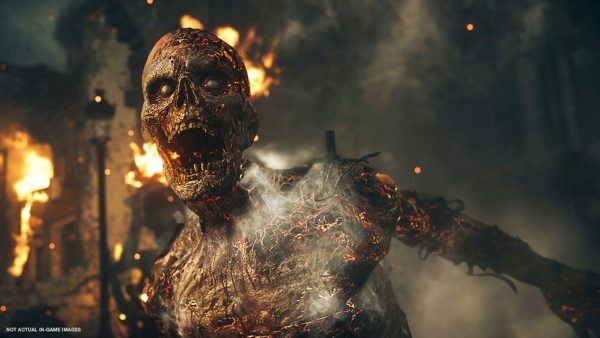 From this point on, Straub’s zeppelin will periodically blast normal zombies with energy, transforming one into a Sizzler. Pests and Bombers seem to be immune to this effect. Step 3: To proceed with the rest of the Easter Egg, you’ll need to assemble a special weapon: The Wunderbuss. It requires two parts. In the Museum beside the Armor machine. In the Museum beside the Faustblizt machine. In the Cabaret beside the M1928 purchase station. The second Wunderbuss part is a Geistbolt. It can be obtained by melee killing a Sizzler. Once you have both parts, head to the room with the caged-off chamber just outside the spawn room/under the Apartments. Place the battery inside the electric panel to unlock the gate, enter the cage, and remove the battery from the opposite side. In the middle of the cage is the Wunderbuss crafting table. Assemble the weapon and fire its primary attack at the electric panel to unlock the cage. Step 4: When Straub’s zeppelin arrived in Step 2, it dropped four glowing red anchors across the map. One anchor is located in the Plaza, another is in the Museum, the third is in the Demolished Building, and the fourth is in the Courtyard. The Courtyard cannot be unlocked until much later in the Easter Egg, but you should probably get a start on this step by charging the other anchors while zombie waves are relatively small. Start with the Plaza anchor and kill zombies near it until it turns green. Then visit the anchors in the Demolished Building and Museum and fire Wunderbuss energy at them until they turn green. (I was personally able to charge the Plaza anchor with the Wunderbuss as well, but as long as they’re green, all is well). To unlock the Courtyard, you will need to collect three upgraded melee weapons across the map: the Smuggler’s Bat (Steps 5-9), the Dancer’s Dagger (Steps 10-13), and the Nazi Axe (Steps 14-17). You can collect these items in any order. Step 5: Inside the Wunderbuss cage is a cash register. Shoot it with the Wunderbuss to open it. Underneath the open register drawer is a photo that contains randomly selected numbers. Enter these numbers into the radio to contact the Smuggler. Step 6: Find the guitar in the Plaza. On the ground near the guitar is a small panel. Shoot the panel and the Smuggler will open it from the other side and ask for a weapon to defend himself. This weapon is randomly-determined each game, but there is a clue to help you out. On the table in the Wunderbuss cage, you’ll find a small pile of ammunition – it could be shotgun shells, small pistol rounds, sniper bullets, or the like. Keep giving the Smuggler weapons based on this bullet type (special weapons like the Wunderbuss don’t work) until you receive a notification that the objective was completed. You WILL lose each weapon you give the Smuggler, so be prepared to buy new weapons afterwards. Once the rounds have finished, find another floor panel in front of the stairs on Main Street leading to the Cabaret. Shoot the panel, and it will open. You now must drop jolts (points) earned from zombie kills into the hole using the left D-Pad button, which the Smuggler will collect. This could take quite some time, but eventually the Smuggler will suggest knocking three times on his apartment door. Step 8: Return to the Wunderbuss cage and hit the door with a melee weapon three times. The door will open and reveal either a dead Wustling, or a live Wustling standing over the Smuggler’s corpse. (If you want to save the Smuggler, you need to give him a Pack-a-Punched weapon, although it’s not necessary for completing the Easter Egg.) Enter the room and take the Smuggler’s Bat. Step 9: Bring the Smuggler’s Bat to the weapon panel beside the Church. Put the bat into its slot. Step 10: In the Apartments (as in the Apartments map location, not the Smuggler’s Room) is a Bedroom with a dead woman on it. This is the Dancer, and we need the dagger from her safe. Start by taking the painting located above the Dancer’s dresser. Bring it to the Cabaret and use the film projector located across from the stage. If you look at the balcony above the projector, you’ll see a film reel. Shoot it to knock it to the floor. Pick it up and use the projector to attach it. Shoot the projector with the Wunderbuss, which shines a light through the painting and displays a map on the stage. Step 11: Take a look at the map on the stage. This is a rough layout of The Shadowed Throne level, with the Church located at the top of the map. You should also see a green dot, which marks the position of an in-game clown doll. Make you way to the clown doll and kill zombies near it. After absorbing a random number of zombie souls, the doll will make a charged sound effect and stop charging – make a note of this number. You’ll need it later. Head back to the Cabaret stage. There will be a new green dot marking another clown doll position. Repeat this step until you have four numbers in total. Step 12: The four numbers you’ve collected are the safe combination. Head back to the Apartments and enter it into the safe near the Dancer’s bedroom. The safe can be finicky because it functions just like a real-world safe. Turn the safe dial right until reaching the first number. Then turn left towards the second number. Turn right again until hitting the third number, and left again to the fourth. If you make a mistake, just turn the dial right in a full circle to reset the process. If you’ve done this step correctly, the safe will open and you can take the Dancer’s Dagger. Step 13: Bring the Dancer’s Dagger to the weapon panel beside the Church. Put the dagger into its slot. Step 15: The translated code reveals a series of map coordinates. Pick up the magnifying glass on the couch near the M1928 station in Cabaret. Use it on the map in the Church, and focus on the coordinates from the code. If done correctly, this will unlock a cabinet beside the map, revealing a Scale Bowl. Pick up the Bowl and place it on the scale found on a table in the Museum. Next, you’ll need to kill a Sizzler using a melee weapon directly beside an Armor machine. If you time it just right the head will get stuck in the machine. Take the head and place it on the Museum scale with the Bowl. Step 16: Activate the scale to balance it. Once the scale is balanced, make melee kills near the rabbit statue beside the scale until it stops absorbing souls. Once finished, a drawer will open on the scale table, revealing the Nazi Axe. Step 17: Bring the Nazi Axe to the weapon panel beside the Church. Put the axe into its slot. Now that you’ve attached all three upgraded melee weapons to the panel, you’ll need to charge them with kills of specific zombie types. First, kill normal zombies near the Dagger until stops charging. Then kill Sizzlers near the Axe. Finally, kill pest zombies near the Bat. The weapons must be charged in sequence. For example, killing pests won’t charge the Bat until you’ve finished charging the Dagger and Axe. Step 18: Breathe. You’re doing really well, but it’s not over yet. Step 19: Once all the melee weapons are charged, the Courtyard door will unlock. Head inside and locate the final anchor somewhere in the ceiling. Charge it with your Wunderbuss until it turns green. Step 20: In the middle of the room is a statue of Barbarossa, surrounded by statues in the nearby walls which face various directions. Attacking a secondary statue will change its direction, but also adjusts the neighbouring statues. Your job is to turn all of the statues so they face Barbarossa. This puzzle is exceedingly tedious, but there are online resources – such as this one – that will calculate a solution for you. Step 21: Once you’ve solved the puzzle, four golden raven statues will appear on the floor in the center of the room. You’ll be able to pick them up and place them on Barbarossa’s statue. There isn’t an obvious clue for these raven placements just yet, so I’d suggest trial and error or referring to video guides like the one below to obtain the exact placements. When the statues are in the correct place, the statue will unlock Barbarossa’s Blade. You’re almost done! Step 22: Prepare for the boss fight. Every player must make sure their Wunderbuss is fully charged. Equip your preferred high-damage weapons, and grab some Jack In The Box grenades from the Mystery Box if you haven’t already – they’re not necessary, but will come in handy. Step 23: When you’re ready to start the boss fight, head to Main Street, where an elevator has lowered from the Zeppelin. Every player must enter the elevator and empty their entire Wunderbuss charge into the ceiling battery at the same time. If you’ve timed it right, the Anchor will take you into the zeppelin. Step 24: Once inside, you’ll need to defend yourself from zombies while activating some electrical control panels. Each panel has a simple map displaying which location the electric charge just traveled to. Keep following the charge and hitting panels in sequence until you reach Doctor Straub. Watch the sequence unfold as the electrical charge reaches Straub, and allow yourself a moment of satisfaction. Step 25: Head in the direction of the Anchor, but watch out! The Stadtjäger boss zombie will spawn in your path. There are three phases to defeating the Stadtjäger. For each phase, it will only take damage during specific points. Be especially careful to avoid its attacks, which deal an impressive amount of damage. Don’t be afraid to buy additional armor and ammo from purchase stations as needed, and throw the occasional Jack In The Box to get some distance from the standard zombies. First, shoot at the Stadtjäger while the heads on its chest and back are glowing. Second, shoot at the Stadtjäger as it fires Geistbolts at you. Finally, shoot the Stadtjäger with the Wunderbuss (and only the Wunderbuss) while it is emitting red smoke. Step 26: Once the Stadtjäger is defeated, exit the zeppelin and enjoy your cutscene. You did it!